Northern Society of Chartered Accountants (NorSCA) and ICAEW are pleased to announce that we will be sponsoring the Accountancy Firm of the Year Award at the North East Accountancy Awards 2015. To enter the Accountancy Firm of the Year category a firm must have an accounting firm in the North East with more than 50 staff. Full details are included on the North East Accountancy Awards website. The awards dinner will be held on Thursday 25 June 2015 at the Hilton NewcastleGateshead. Last years 8th annual North East Accountancy Awards were presented at a dinner held on 26 June 2014 and ICAEW Chartered Accountants celebrated the success of fellow north east finance professionals in a glittering evening that was hosted by BBC Breakfast News presenter Colin Briggs (from BBC North East & Cumbria). The event, which involved close co-operation from CIMA, AAT, CIPFA, ACCA, CIOT as well as ICAEW was attended by 400 people. 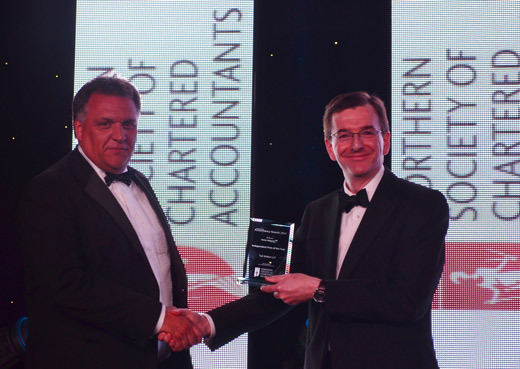 Pictured is Andrew Jackson, President of Northern Society, who presented the Independent Firm of the Year Award 2014 to Andrew Moorby, managing partner from Tait Walker.